MANKATO, Minn.–The remains of a southern Minnesota sailor killed at Pearl Harbor will be laid to rest more than seven decades after his death. Radioman 2nd Class Quentin Gifford, 22, was on the USS Oklahoma when it was capsized by torpedoes in December 1941, The Mankato Free Press reported. The U.S. Navy had listed Gifford as lost in action since February 1942. Human remains from the attack site were taken to a Navy lab in 1941. Relatively few of the seamen were identified and all unidentified remains were buried in a Hawaii gravesite. The Navy began exhuming soldiers in 2015 to analyze their DNA. Three of Gifford’s siblings contributed DNA for analysis in 2016. Gifford’s remains were identified in July. 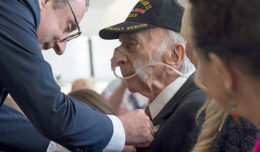 “I had this hope his body had been completely destroyed — that he had not been obliged to suffer,” said Harold Gifford, Quentin Gifford’s brother. 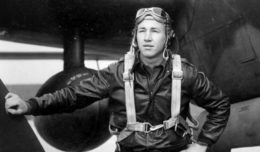 Details from the military about his brother’s remains indicate that he likely died quickly, Harold Gifford said. Services will be held at Fort Snelling National Cemetery on May 2, Gifford said. The service will include a 21-gun salute. Quentin Gifford’s casket will be accompanied by an honor guard detail to a Twin Cities area fire hall.